The Connecticut-born Edwards is certainly worth remembering and honoring, even by those of us who don’t agree with some of his emphases. About six weeks ago, I finished reading James Wm. McClendon’s book “Systematic Theology: Ethics” (1986). I was surprised when I found that “Sarah and Jonathan Edwards” is a chapter in that book. Jonathan and Sarah (Pierpont) married in 1727, when she was only 17. McClendon states that they “were lovers,” and that their love “drew them heavenward in a union at once spiritual and uncommon” (p. 131). Edwards, a Puritan, became the pastor of a Congregationalist church, First Church of Northampton, Mass. He succeeded his grandfather, Solomon Stoddard who had served as pastor there for 60 (!) years, from 1669 to 1729. Edwards was also a leader of the “Great Awakening,” a revival movement that started in 1734 and lasted for around 25 years. His emphasis on personal religious experience called infant baptism into question. Thus, according to church historian Justo González, “many Congregationalists and Presbyterians, led by the Awakening’s emphasis on personal experience, eventually rejected infant baptism and became Baptists. Entire congregations did so” (“The Story of Christianity,” II:289). 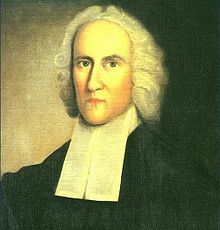 Edwards is best remembered for delivering the most widely known sermon in the United States: “Sinners in the Hands of an Angry God,” preached in July 1741. That sermon has often been included in anthologies of American literature. “The God that holds you over the pit of hell, much as one holds a spider, or some loathsome insect over the fire, abhors you, and is dreadfully provoked: his wrath towards you burns like fire; he looks upon you as worthy of nothing else, but to be cast into the fire.” This is a quote from Edwards’s famous sermon, but I’m afraid it would not have the same effect now as it did 270 years ago. Edwards’s most widely read book is the biography of a young missionary to the Native Americans who died at the age of 29 in 1747. It is titled “The Life of David Brainerd” (1749), and has never gone out of print, having positively influenced a great many missionaries through the years. In the winter of 1758, Edwards traveled down to New Jersey to become the president of the college which later became Princeton University. When a smallpox epidemic struck the region, in order to serve as a model and example to his students Edwards received a smallpox vaccination—but he tragically contracted the disease and died that March. During his short time in New Jersey, Edwards had stayed with his daughter, Esther. She was the widow of the first president of the college, Aaron Burr, who had died in Sept. 1757. So Jonathan was the grandfather of Aaron Burr, Jr., the third Vice-President of the U.S.
Marty asked his readers to decide who they would select for the fourth face on the “Mt. Rushmore of Protestant American shapers.” Who would be your pick? This entry was posted in Regular Post and tagged Edwards (Jonathan). Bookmark the permalink.